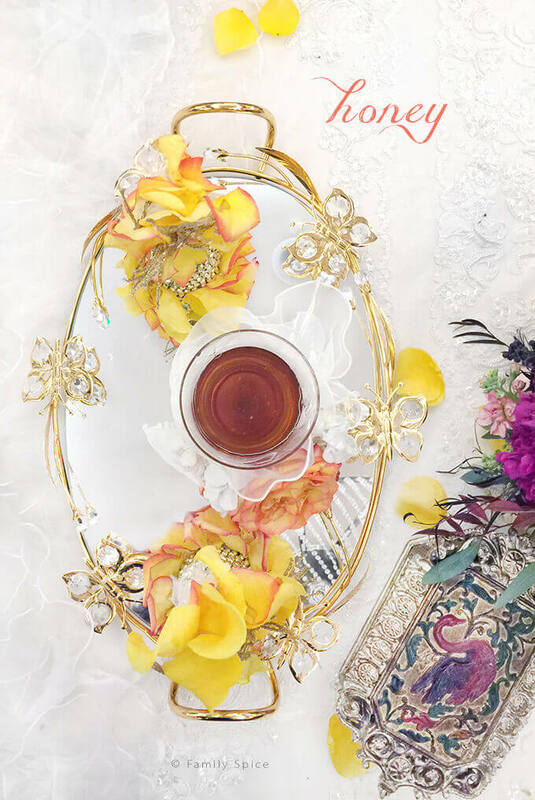 All of the traditions and symbolism in a Persian wedding ceremony is explained: from the aghd and the aroosi, to the sofreh and the sweets and everything else in between! A wedding is always a beautiful occasion full of love, happiness and the merging of two families. It can be amazing, fun and totally stressful for the parties involved. But, one of my favorite wedding experiences is attending a Persian wedding. 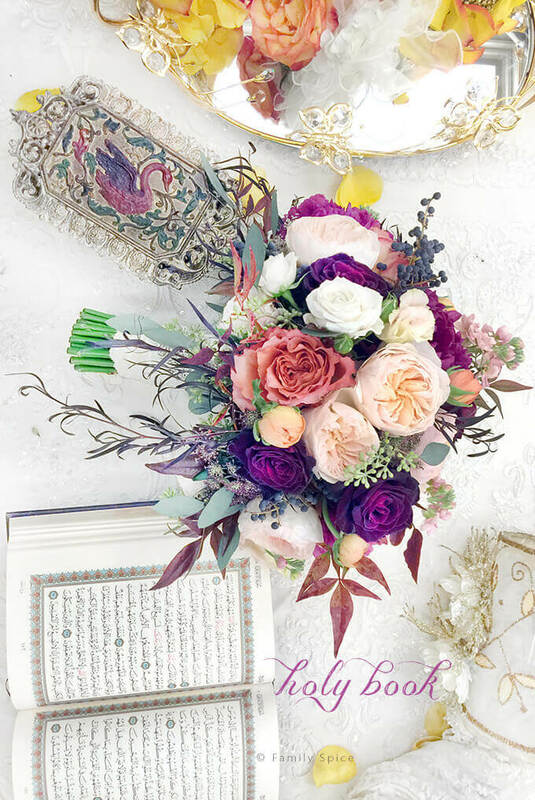 There is tremendous history, symbolism and beauty found in a Persian wedding ceremony. These are traditions that are honored regardless of religion, too, which is key during these turbulent times in the middle-east. Why all this wedding talk? 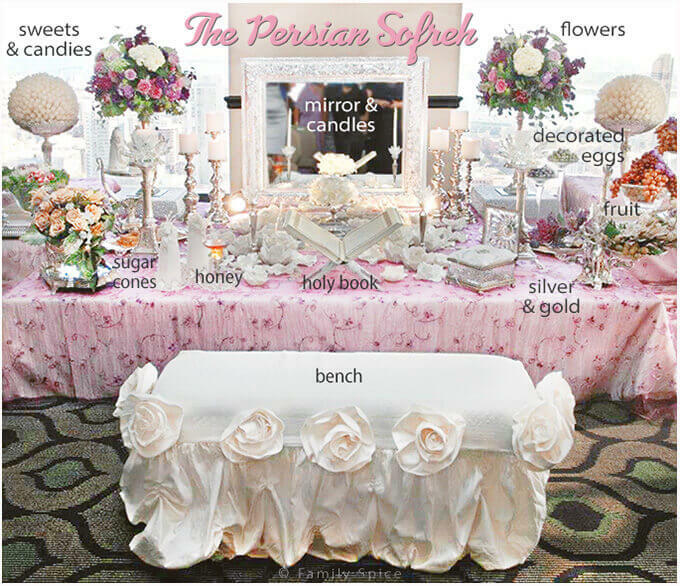 A traditional Persian wedding is broken into parts: the aghd (the actual ceremony) and the aroosi (the reception). This is similar to western culture, except that in a Persian wedding, both the aghd and the aroosi can be held months apart. But typically in modern times, they are held the same day. The aghd is usually a smaller ceremony, held for only family members and close friends to attend, while the aroosi is a larger party and celebration and more formal affair. It is very common even today for the women who attend both ceremonies to wear two different outfits, one colorful and happy for the aghd and one more formal for the aroosi. Me? I’m Ms. Practical. I wore just one dress. The aghd is performed in front of a sofreh, a symbolic wedding spread placed on a beautifully arranged wedding cloth. The sofreh-e aghd is placed low to the ground or on the ground and the bride and groom sit on a bench facing the sofreh. The sofreh has many symbolic items placed upon it. Most of the items listed below are required on the sofreh, but each region of Iran has certain items that are significant to them. A mirror reflects what is before it, so symbolically it brings the couple abundance and brightness in their future. The candles bring passion and energy. As the story goes, the first thing the groom should see is the face of his beautiful bride reflected in the mirror, lit by the light of the candlesticks. 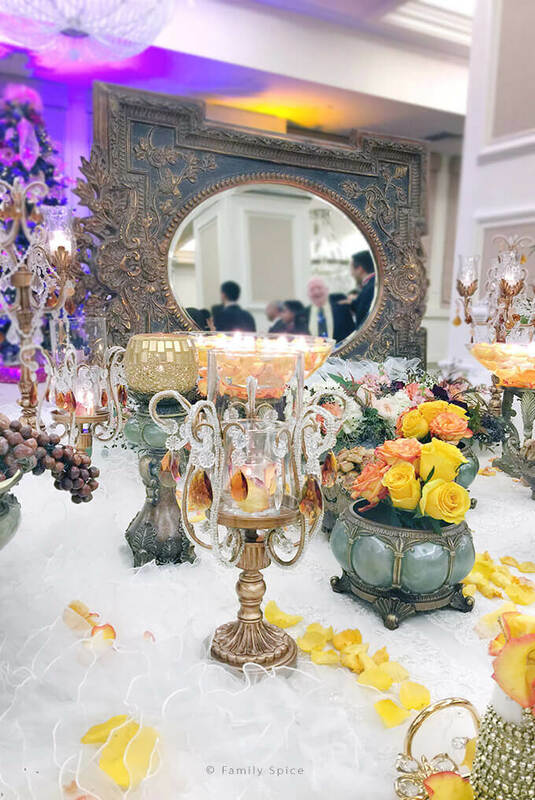 Both the mirror and the candlesticks were traditional gifts given from the groom to his bride, but today everything is coordinated in the colors and taste of both the bride and groom. The wedding mirror and candlesticks are also the first items to be brought to the newlyweds’ new home, bringing them the same love and good luck they received during their wedding. During the ceremony, the bride and groom are sitting on the bench and facing the mirror and sofreh. Vows are exchanged here as they are surrounded by loved ones. While the ceremony is conducted, single women or female relatives of the couple hold a fine cloth, over the couple’s head. They alternate grinding the sugar cones over the bride and groom’s head, adding more sweetness to their life together. When the bride is asked a third time if she will marry the groom, then she answers,”Yes, with the permission of my parents and elders.” Everyone cheers and the sugar cones and cloth are placed back on the sofreh. Once the bride and groom are pronounced man and wife, they exchange rings. A bowl of honey is presented to the couple, and the groom dips his finger into the honey and gives it to his bride. The bride reciprocates and offers her husband honey, as well. 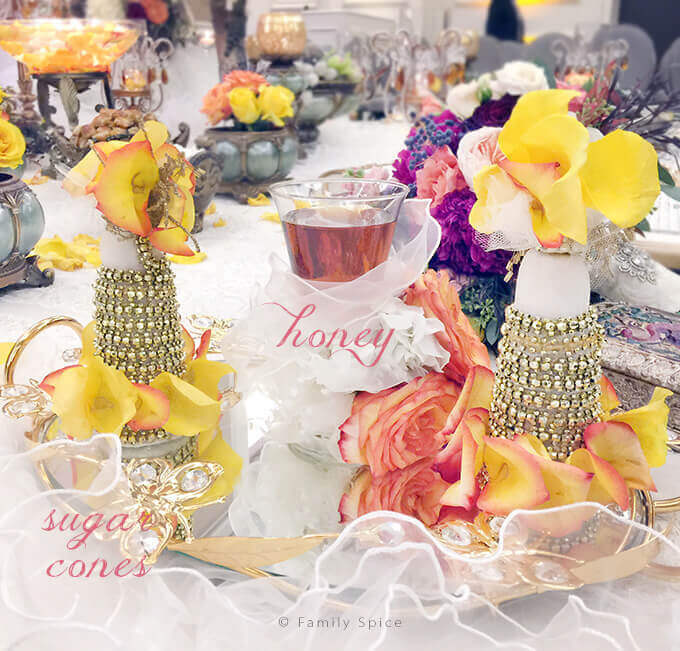 Again, the sweet of the honey symbolizes a sweet life together. Each sofreh-e aghd is customized to the taste and customs of the families joining in marriage. This can vary on what region of Iran the families come from, the religions of each and general preferences. Below is a list of some more common items found on the sofreh. Esfand: a Persian incense that is burned and used for thousands of years to ward away the ‘evil eye’. Immediately after the ceremony is done, family members walk up to congratulate the bride and groom. Wedding gifts are usually given at this time, which is traditionally money and jewelry. Yes, my American friends enjoyed watching my family and in-laws adorn me with necklaces and bracelets! Just like its western counterparts, Persian weddings and the sofreh-e aghd can vary among style, ornateness and taste of the bride and groom. Some have a traditional feel, others more modern. For my wedding (pictured above), my then fiancé made two stainless water sculptures for our sofreh. We also worked together, designed and made the mosaic mirror that took center stage. The mirror hangs in our family room still today, 15 19 years later. Wow. Has it really been 19 years? Sorry, babe to embarrass you with these pictures…. I think my mom would point out that I’m slouching and not sitting up straight! 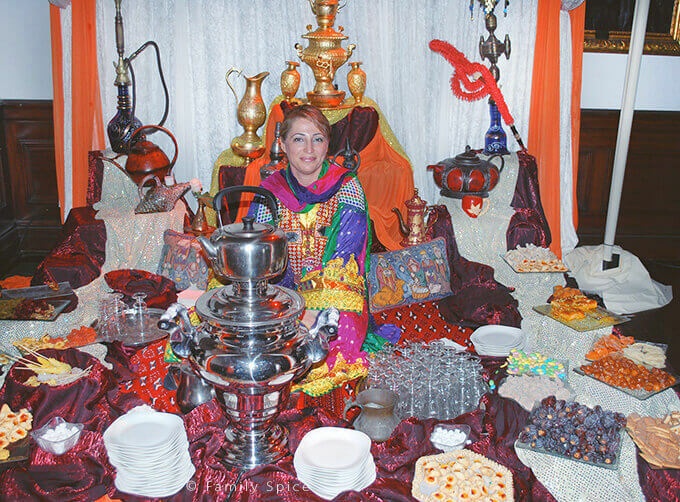 A current trend in Persian weddings, especially in Los Angeles, is to have a woman dressed in traditional village attire under a great canopy to serve tea in a samovar for the wedding guests to enjoy. An assortment of Persian sweets and treats and also available for the guests to sample. It’s a fun novelty, especially when you have foreigners attending the wedding. 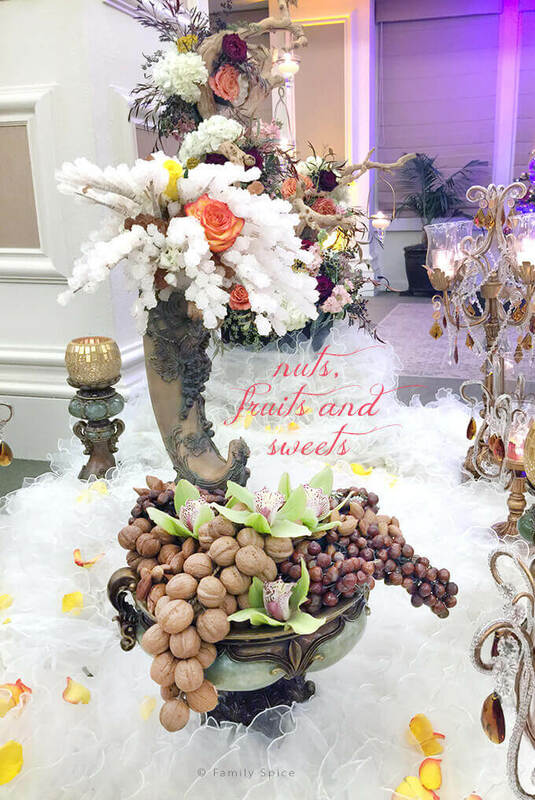 Most traditional wedding receptions serve an over abundant supply of Persian deliciousness: stews like Gormeh Sabzi (Herb Stew) and Fesenjoon (Chicken with Pomegranate and Walnuts), are always popular, as well as chicken, filet mignon and ground beef kabob. 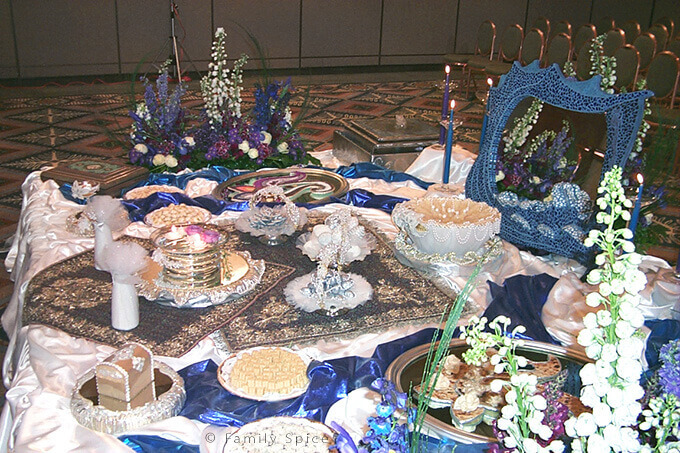 The menu of the Persian wedding reception is set by the personal preference of the wedding party. I hope you enjoyed this little journey down memory lane for me. And if you ever get invited to a Persian wedding, I hope you go and enjoy the adventure ahead. It is a very beautiful ceremony, no matter what religion the bride and groom hold. And I hope this explanation of the symbolic sofreh helps you enjoy it even more. If you enjoyed this article, then you might want to learn about Norouz and the Persian New Year? 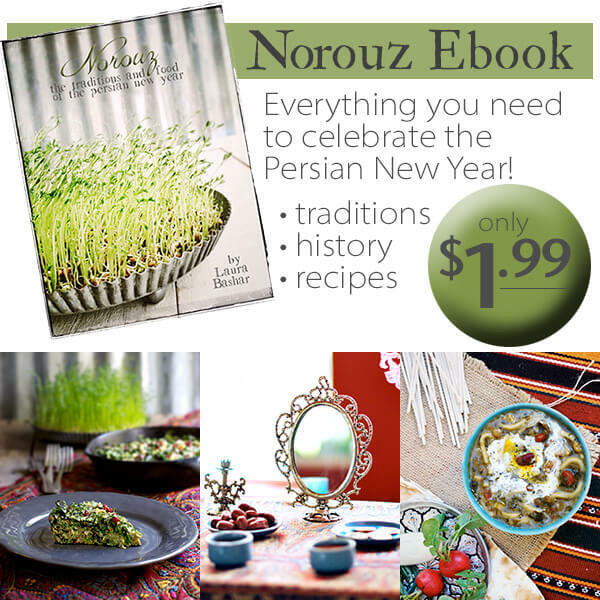 I have put together an ebook that has all the history, traditions and recipes of Norouz, in a beautifully photographed ebook. And it’s only $1.99! Learn more here! Previous Post: « Take the October #Unprocessed Challenge! Beautiful pictures of your wedding! Oh, so beautiful and I love learning about your culture! 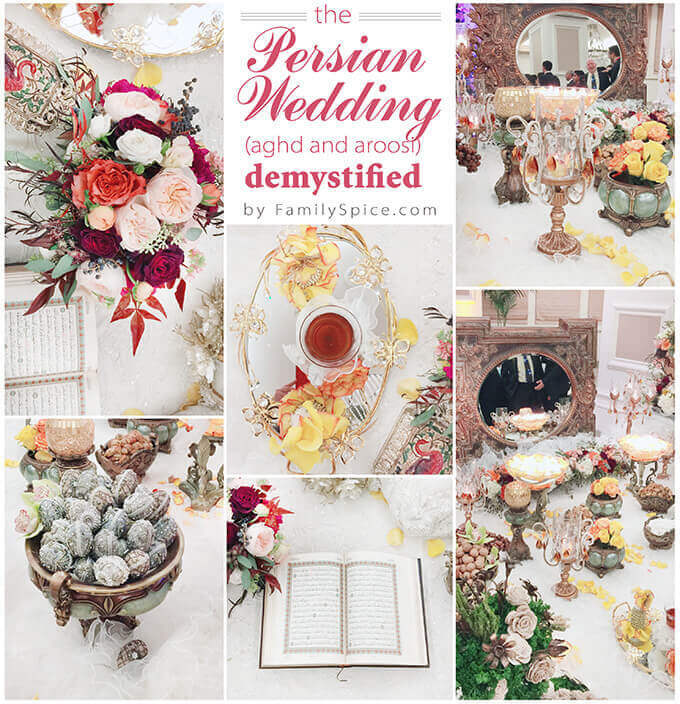 It’s lovely to read about all the symbolism in a Persian wedding. It must be such a special day for all concerned, one to never forget. Great pictures, wonderful info. I really learned a lot – thanks so much for sharing. So interesting and beautiful! More, please. How lovely! Thank you for sharing and teaching! At a time peace is not always present in the Middle East, it is heartwarming to be where love is 🙂 ! This is a really fascinating post. I loved your pictures, too. Can’t wait to hear about the reception! Beautiful photographs and loved reading this post! This is amazing – I love seeing these pictures and learning more about the traditions behind each part of the ceremony. Now bring on the food! I can’t find the promised food post. Can you point me in the right direction? I have not been able to write it yet. 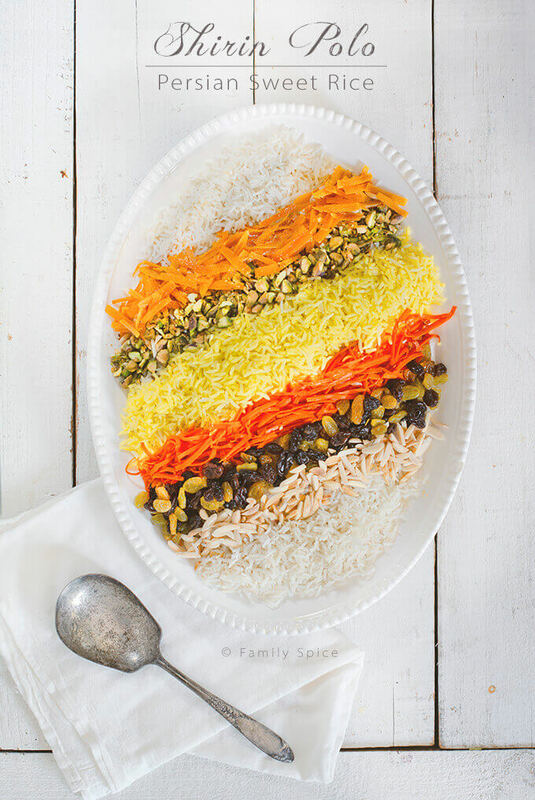 One of the dishes that is a must for a Persian wedding is Shirin Polo (sweet rice). And I will have this recipe up December 9th. I will email you the link when it is ready. Click on any of the weddings for a full report on that Persian wedding with photos, etc. Very nice article and beautiful pictures. Thanks for providing such great insight into Persian wedding ceremonies. 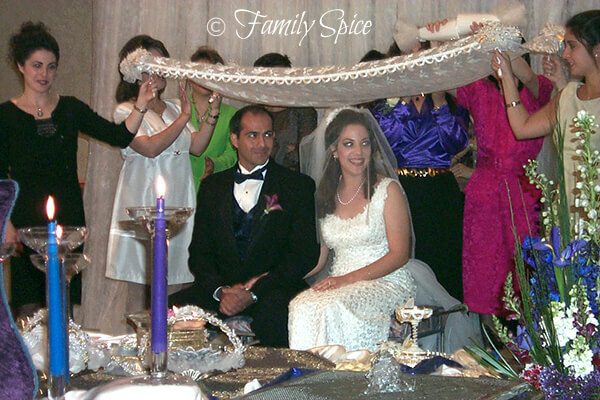 You may also want to check out the photo gallery of my new website at http://www.PersianWeddingOfficiant.net where I have gathered some of the pictures of the Persian wedding ceremonies that I have had the privilege of being the wedding officiant. we will of course give you the credit. Please do not repost everything on your site, as this infringes on my copyright. But you can quote me and link back to this page. Thank you! I love filming Persian weddings – so many beautiful symbols, colors and smiles. Lovely people too! I’m Iranian. You could even impress me!!! You are definitely a talented writer and Iranian weddings are absolutely beautiful! You described everything in detail. Bravo! Thank you, Fahimeh! Persian weddings are truly a magical experience that I hope non-Iranins get an opportunity witness. Everything is beautiful. Is there a guideline for how big the mirror should be? Thank you! I have never read anything giving specific dimensions for the mirror. It needs to be large enough for the couple to see their reflection in it, it is typically a large mirror. Really nice post as I’m getting ideas for my aghd, but I thought I’d note that eggs are not traditionally part of the sofreh. It seems to be a new thing, maybe taken from the sofreh haftseen. 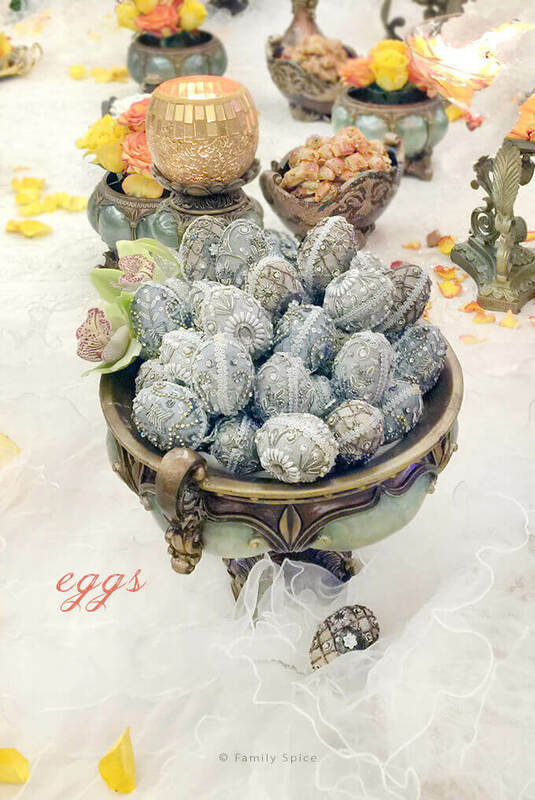 I always see eggs on a wedding sofreh, as it signifies fertility. Whether it was there originally or not, I do not know. The wedding sofreh does vary amongst regions and family traditions. For example, my cousin’s wife snuffed out the candle flame with her pretty shoe because it was tradition in her family — although she admitted she didn’t know what it signified! Good luck with your planning. There are so many gorgeous sofreh’s out there. 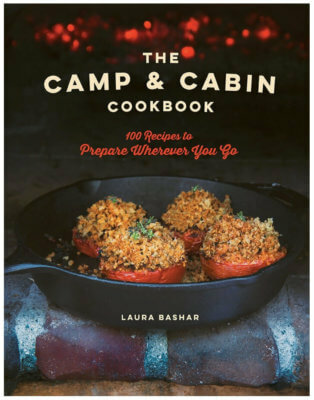 Make it personal for you and your husband-to-be!